Why The World Might Be Running Out Of Cocoa Farmers : The Salt West African cocoa farmers earn less than $1 a day. Those low wages could jeopardize the future of chocolate labor, as young farmers find better opportunities to earn a living, a new report warns. Farmer Issiaka Ouedraogo walks past cocoa pods growing on a tree, on a cocoa farm outside the village of Fangolo, near Duekoue, Ivory Coast in May 2011. Chocolate might be headed toward a crisis, depending on whom you ask. That's at least what the 2015 Cocoa Barometer has to say. It's an overview of sustainability issues in the cocoa sector, written by various European and U.S. NGOs, and was released in the U.S. this week. And what they're really worried about is the people who grow the beans that are ground up to make our beloved treat. "The world is running out of cocoa farmers," the report states. "Younger generations no longer want to be in cocoa. Older generations are reaching their life expectancy." It's well known that most cocoa farmers live in extreme poverty. 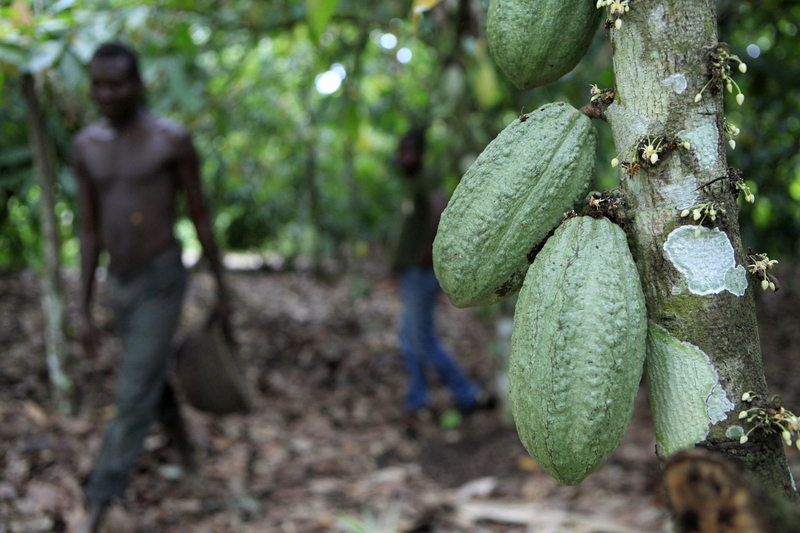 There are about 2 million small-scale farmers in Ghana and Ivory Coast, the West African countries that produce at least 70 percent of the world's cocoa beans. The average cocoa farmer in Ghana earns 84 cents a day, while the average small farmer in Ivory Coast earns just 50 cents a day, according to the Barometer. Should You Stock Up On Chocolate Bars Because Of Ebola? I met two women cocoa farmers at the World Cocoa Foundation's meeting in Washington, D.C., this week. Assata Doumbia tells me (in French, through a translator) that she and her husband are both in ECAM, a cooperative of 900 farmers in Ivory Coast, and that their income is "extremely low, almost nothing." What little they do earn goes straight to her husband. "Men have all the control and decision-making power in the cocoa sector," she says, though she and a few other women are trying to change that for the 120 women in the cooperative. And there's another reason younger farmers with better opportunities wouldn't want to grow cacao: It's really hard work. As we've reported, the big pods that contain the beans have to be hacked open with machetes or clubs. Then they're cleaned, dried and fermented before they can be ground up and processed into cocoa. And it's not just NGOs who fear a labor shortage in West Africa. Bill Guyton, president of the World Cocoa Foundation, tells The Salt that the members of his organization — the world's biggest chocolate companies, including Mars, Hershey and Ferrero — are anxious, too. "There is a concern about whether incentives are in place, whether the training and input will be there to attract the next generation," Guyton says. "There are a lot of land tenure issues, too. Farms are getting smaller as farmers pass on land to multiple children." Guyton says WCF is hoping to shore up production with a new strategy aimed at 300,000 farmers in Ghana and Ivory Coast. Called CocoaAction, the plan aims to help farmers improve their yields by helping them get better access to fertilizer and seedlings for new trees so that they can earn higher incomes. "And we're looking at how we can do a better job working with African governments and incentiving young people to continue on in cocoa farming," Guyton says. But Elizabeth O'Connell, fair labor campaigns manager of Green America, one of the groups involved with the Barometer report, says she's concerned that the programs already in place to help farmers boost yields also leave them increasingly reliant on chemicals and fertilizer. "They increase yield in the short term, but they may not benefit the soil — and the farmers — in the long term," she says. An earlier version of the story stated that the women cocoa farmers belong to a cooperative called Le Conseil du Cafe-Cacao. In fact, their cooperative is called ECAM.